What are the best camper shell racks in 2019? If you’re looking for the best camper shell rack but are too busy to go through all the material we have prepared, the following paragraph is meant to offer a short summary of our conclusions. In all the reviews of camper shell racks we’ve looked at, the Vantech M1009B was well praise due to its remarkable sturdiness. The crossbars on the M1009B are made of thick, 3-mm aluminum, which offers enough tensile strength to handle 500 lbs loads without bending. Furthermore, this is bolted to the roof instead of just fixed with clamps, so it is highly unlikely to ever come off, even under the most unfavorable circumstances. If you don’t want to drill holes through your vehicle’s roof, then the Hauler Racks C300FULL-1 is widely considered a reliable choice for a removable shell rack. This shell rack uses 3-mm thick aluminum in the construction of two crossbars that serve the purpose of providing the user with extra storage room on top of the vehicle. The material used has been coated in a layer of powder, which enhances its qualities when fighting corrosion. They come in two colors and the installation process can be completed by just about anyone. A few customers have complained that it’s difficult to mount the racks using the original hardware that they were delivered with and might sometimes need an adjustment. Try this model if you’re looking for a reasonably priced and durable alternative. The clamp-on mounting system these racks use is probably their most relevant feature. Aside from that, they fit tightly and have a high chance of staying in place even during a rough ride, so you don’t have to worry about your luggage falling off. They can support an up to 300lbs, so they should be more than enough for a usual trip, depending on the roof durability. Sometimes it’s difficult to fit this item onto certain vehicles, especially on roofs that are not leveled. Aside from this issue, they should fit most dimensions. This product is a good choice for anyone looking for a fast installation process. Very similar to the other option from Ventech we’ve also reviewed, these racks bring a few improvements. First of all, the width of the crossbars is slightly increased, 75 inches in this design, which makes them a better fit for some wider vehicles. Their weight limit is around 500 lbs, which means that depending on your roof’s durability you could carry a lot of luggage. There have been complaints saying that these racks are a better fit for narrower vehicles, because they barely reach across, resulting in an unstable position. The slightly improved version of the M1009B will offer you plenty of storage room. A camper shell rack can greatly increase the carrying capacity of a truck, which makes it highly useful to anybody from professional contractors who need to haul around their tools of the trade to sports enthusiasts that can attach specialized bike and kayak racks to it. Finding the best rack for camper shell isn’t as straightforward a task as we might imagine since there is a great variety of products available for sale. To ensure that we make the right pick, there are a few things to have in mind before purchasing. 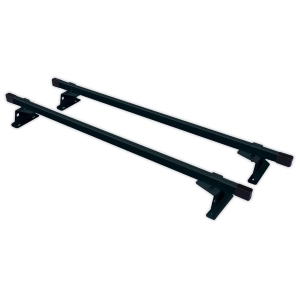 There are two main ways in which racks are attached to the canopy of a truck, either by bolting it in place on the top plate or by fixing it to the bed rails using horizontal bars and clamps. One of the advantages of the second camper shell rack system is pretty obvious, in that it doesn’t require for holes to be drilled through the roof to allow the bolts through. This will make it easy to remove at will without leaving some undesired air vents behind, besides eliminating the risk of rust forming around the holes. The removable rack offers some disadvantages, however, mainly that the many joints and bars used to keep it in place will not offer an equally stable platform as a bolted rack would. And when there’s a lot of space for slacking, there’s also a lot of room for mechanical failure, and you might end up with your cargo all over the road when a nut happens to snap under heavy load. This factor comes mostly down to your own needs. A contractor might require a maximum carry weight in the range of 500 lbs for heavy equipment, while weight will be a non-issue if a pair of kayaks is the only thing you expect to be transporting. What’s important to note is that as long as the roof is sturdy and the mounts are properly placed, a bolted in rack will be safer to load to full capacity, since there are fewer connectors to worry about. Conversely, a removable rack will allow for better weight distribution, so you might want to look into it if the roof isn’t that solid. The crossbars are usually made of aluminum or steel. Probably all readers know that the first is lighter while the second is tougher and harder to bend under weight. The camper shell rack mounts or plates should be wide enough not to damage the roof, and malleable enough to allow for an easy installation. After carefully considering the opinions of both satisfied owners and specialized reviewers we’ve settled upon the products below as our top picks. This bolt-on shell rack earned a lot of appreciation for its exceptional sturdiness, conferred by the use of 3-mm thick aluminum for the two rectangular crossbars, mounting brackets and interior plates. The gaskets it comes with are polyfoam, so they don’t rot as easily as rubber. The aluminum has been powder coated for better corrosion resistance, which also gives it a cool look that will make you never want to take it off, which is just as well, because this unit is bolted to the roof through four relatively wide plates and steel hardware. It’s been commented that these don’t allow for any give when connected with the crossbar, so they cannot usually be placed at an angle without tools. We believe that this is a feature, not a bug, since racks are supposed to stay firm, and the installation process itself is fairly easy going once the plates have been bent into shape with a hammer. This is a removable, or clamp-on, or whatever-you-want-to-call-it shell rack from the ever popular Hauler Racks. It connects to the rails on your truck’s shell without requiring to be bolted in place. 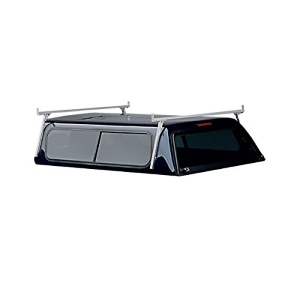 This often comes with the disadvantage of being hard to fit on certain trucks or minivans, but judging by the comments surrounding this product, it seems to be adaptable enough to mount on any mini, mid and full sized truck as long as the roof is leveled. Also from the client reviewers, the C300 is said to fit very tightly and stay in place under fast turns, even with heavy loads. It can be used to carry up to 300 lbs, according to the manufacturer’s specifications, and this isn’t dependent on the roof’s durability, as the weight will be evenly distributed around the midsection of the vehicle. Anodized aluminum was used for the platform and the clamps, to keep them light and rust-free under any weather. This is the slightly bigger version of the M1009B that we’ve highlighted above and very similar in specifications and general quality. Meaning that people are impressed with how sturdy it is, they like the slick black finish, and they find it easy enough to install once the mounting plates have been shaped into place with a wooden or rubber hammer. The only significant difference can be found in the width of the crossbars, which are 75 inches in this case, as opposed to the 60 inches of the M1009B. This means it will look nicer on wider trucks and you can spread out your cargo over a larger surface when using it. It has the same maximum weight allowance of 500 lb which we don’t recommend you put to the test with a truck that has a fiberglass canopy because although this might hold well when static, the extra forces the roof will have to handle while moving might make it to give in.